If you’re heading somewhere like Iceland or Finland in winter, the chances are you are hoping to see and photograph the Northern Lights, also known as the Aurora Borealis. This spectacular phenomenon is truly wonderful to behold, and getting pictures of the aurora is a great way to remember the experience. That said, taking pictures of the Northern Lights is a notoriously tricky business. It’s going to be dark, which is when most cameras struggle to produce great images. It’s also likely to be cold, the lights will be moving, and even simple tasks like getting the focus right can be difficult. In my opinion, Northern Lights photography is one of the more challenging types of photography to get right. To help you out, I’ve put together this guide to how to photograph the Northern Lights. I’m going to share with you everything you need to know, from camera settings, to equipment, to tips on where to go to get the best photos of the Northern Lights. This is based on my years of experience as a travel photographer and various occasions chasing the Northern Lights in different locations around the world, as well as more general astrophotography experiences. Note that whilst this guide is for the Northern Lights, it will also work for the Southern Lights, also known as the Aurora Australis. These are generally harder to see as there are less accessible landmasses near the south pole, but they can sometimes be seen from New Zealand, the Falkland Islands and the southern tip of Argentina. Can I still photograph the Northern Lights without manual settings? 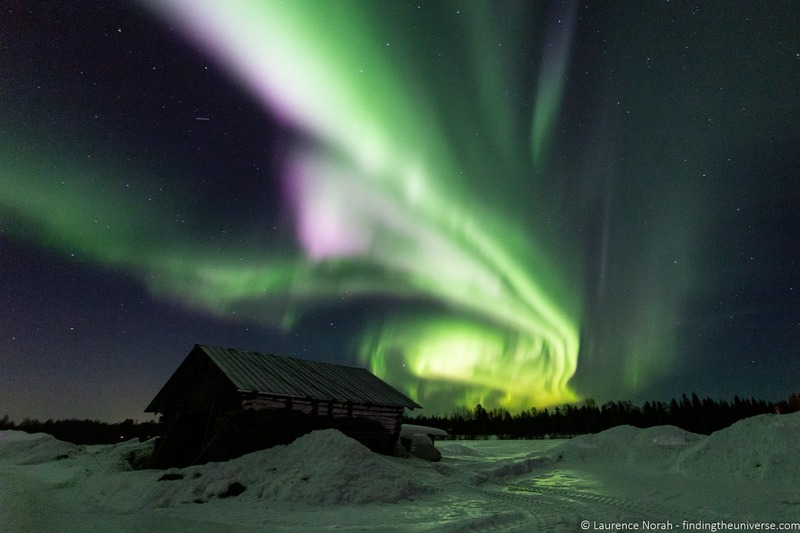 Can you Photograph the Northern Lights with an iPhone or Smartphone? Before you set out, camera in hand, ready to photograph the Northern Lights, you’re going to need to be somewhere where you have a good chance of actually seeing them. Generally, the best place to see the Northern Lights is from a northerly latitude – somewhere either close to, or inside, the arctic circle. The arctic circle is a line of latitude at around 66 degrees north, or anywhere within approximately 1,200 miles of the north pole. The best viewing latitudes are from around 68 degrees north to 74 degrees north, which is usually where the strongest Northern Lights displays are seen from. This basically means you need to be fairly far north for the best viewing opportunities. The northern regions of Finland, Sweden and Norway for example, make for good viewing in Europe. Iceland is also a popular destination, as the country lies very close to the arctic circle. Large swathes of Canada and Russia are also close to or inside the Arctic Circle, as is Greenland. If there is particularly strong activity, it’s also possible to see the Northern Lights from more southern latitudes, including in Scotland where I have seen them, as well as the northern United States. However, the best chance of seeing the Northern Lights is definitely further north. 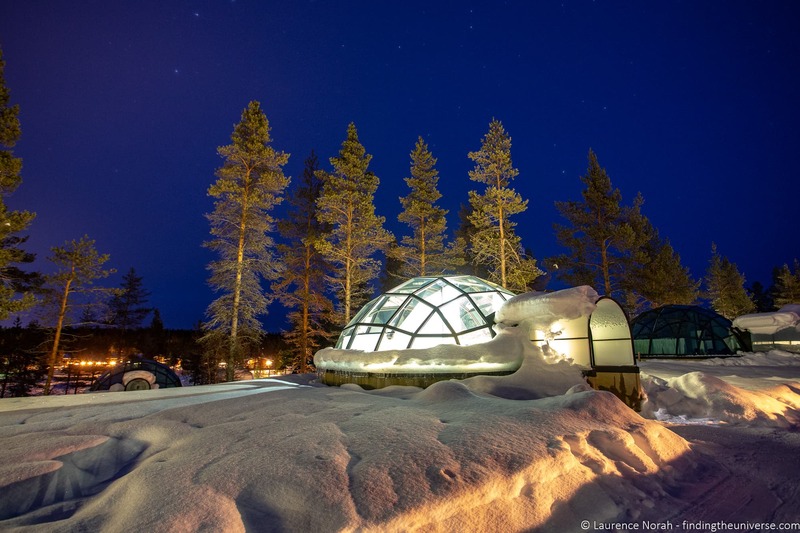 Some of these locations, like Finland, are particularly well set up for Northern Lights viewing, with fun accommodation like glass igloos which can give you both a great viewing experience, as well unique sleeping experience. 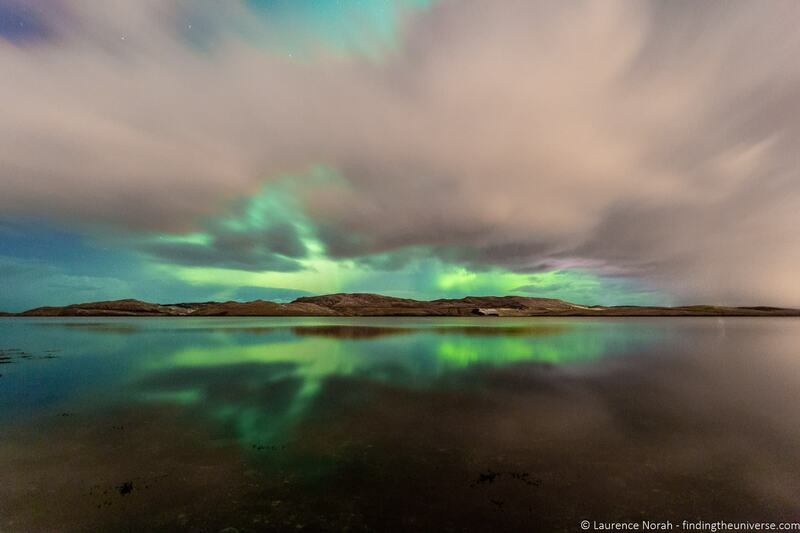 Iceland is also a popular northern lights viewing destination, with many northern lights viewing tours on offer. We have lots of content on both these destinations to help you plan a trip. See our guide to visiting Finland in winter for more information, and our guide to planning a trip to Iceland as a starting point. The best time to see the Northern Lights is from September to April. This is when the skies are dark enough to see them. Personally, I would add that the months of September and March are my favourite time to try and see the lights. This is because in the northerly latitudes, the depths of winter can be a particularly cold time. These shoulder months tend to be a little less cold, and make the experience of Northern Lights hunting more pleasant. Of course, you will have to factor in local weather patterns—if you’re visiting a country where it rains a lot in a certain month for example, you’ll want to try and avoid that! February and March are more likely to offer shots of the Northern Lights against snowy landscapes, which are particularly beautiful. Photographing the Northern Lights is a test for any camera (and photographer!). Whilst for the majority of photography I would argue that the camera is generally less important than people might think, for some situations a good camera and lens will make a big difference. Northern lights photography is one of these situations! The reason for this is that the Northern Lights are only visible when it is dark. And whilst most cameras will take great pictures in daylight, taking great pictures when there is limited light available is a real test. This is why you might find your smartphone does a great job in daylight, and not so great a job indoors or at night. The reason for this is down to the way a camera records an image. A camera works by capturing the available light on a light-sensitive sensor inside the camera. In the past, this was predominantly a piece of film where the chemicals reacted to the light. Today, this is done digitally. Digital technology has meant that we can now have cameras in many things we didn’t have cameras in before, however, it also means that the sensors have gotten a lot smaller. To fit a camera inside your smartphone means that the sensor is way smaller than the sensor inside a professional DSLR camera. In most daytime situations, this doesn’t make too much difference because there is loads of light available. 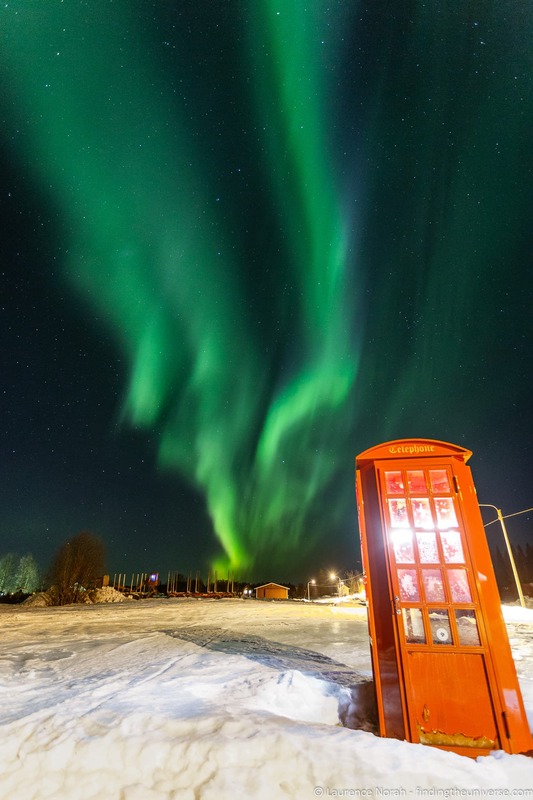 At night however, it’s a different story, and the small sensors in smartphones and compact cameras will struggle to pick up enough light to produce a usable image – even with a relatively strong Northern Lights display. All is not lost though. You don’t need a super expensive camera to capture the Northern Lights, as long as you have the right equipment overall. Let’s look at what that is. It goes without saying that you are obviously going to need a camera to take pictures of the Northern Lights! The basic requirement is that the camera lets you control the shutter speed. The shutter is a physical barrier between the cameras sensor and the light passing through the lens, and the shutter speed dictates how long this opens when you press the shutter button. Low-light photography requires you to take photos where the shutter is open for a prolonged period of time, usually between 5 and 30 seconds. This is also referred to as long-exposure photography. Many cameras let you control the shutter speed, including some smartphones, some compact cameras, and the vast majority of mirrorless cameras and DSLR cameras. Check your camera to see if it has either a manual mode or a way of otherwise controlling the shutter speed. This will either be accessed via the camera mode dial, or somewhere else in the settings. If it’s not immediately obvious, check the camera’s manual, or just search online for something like “change shutter speed <your camera model>”. You should also check to see what the maximum exposure it will allow is—this is normally around 30 or 60 seconds, but may be less in the case of smartphones or compact cameras. To check, just put the camera into shutter priority or manual mode and adjust the shutter speed until it’s as slow as it goes. For example, on my Canon camera, the slowest shutter speed I can do in shutter priority or manual mode is 30 seconds, which is indicated as 30″ on the screen. My Google Pixel 3 smartphone has a maximum 4 second shutter speed. I mentioned that you don’t necessarily need a high end camera to get good photos of the Northern Lights, however, you will get better results with a camera that has a bigger sensor. As a rule of thumb, you can order camera types as follows for northern light photography, from best to worst. Those at the top of this list have the largest sensors, meaning they can capture more of the available light. If having read all this you think you might be in the market for a new camera, check out our guides to the best compact cameras, mirrorless cameras and DSLR cameras, as well as our guide to choosing a travel camera. 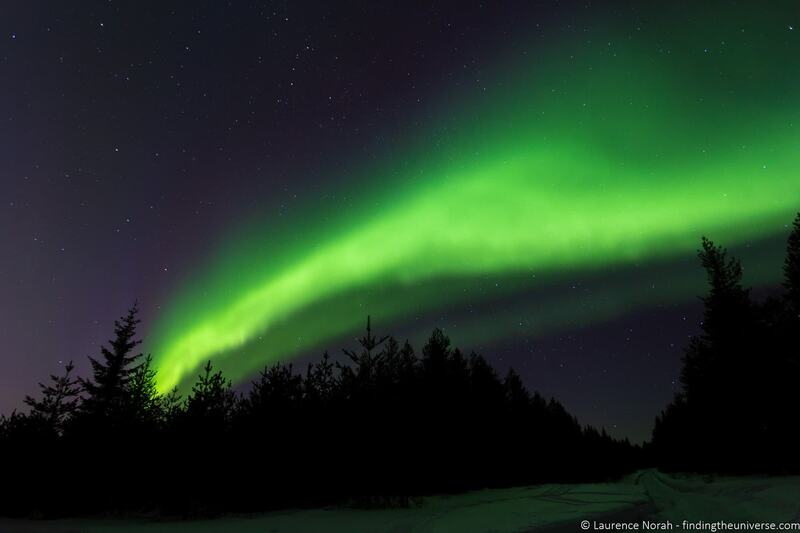 The Northern Lights are a phenomenon that can take up a great deal of the night sky. If you are lucky, it will span from one horizon to the other, and fill your field of vision. In order to capture this incredible display, you are going to want a suitable lens that lets you get an image of as much of the sky as possible. If are shooting with a camera that doesn’t have an interchangeable lens, just zoom out as far as possible to get as much in. If you do have a camera that lets you change lenses, you’re going to want to use what’s called a “wide-angle” lens. This is a lens which has a very wide field of view, and it will let you capture more of the night sky. You can tell a wide angle lens by its focal length. Focal length is a measurement used in photography to indicate what the field of view of a camera is. A wide angle lens will usually have a focal length from around 8mm (very very wide) to 24mm (still wide but not so much!). The exact focal length will vary depending on the type of camera you have and the size of the sensor. For a full frame camera for example, a wide angle lens like this 16-35mm Canon lens, or this 14-24mm Nikon lens would be perfect. Third party solutions like this 14mm prime from Rokinon provide great value alternatives. The other consideration is the aperture of the lens. The aperture is the hole in the lens that lets light in – it’s similar to the pupil in your eye. Much like your pupil, the aperture can be larger or smaller. When it’s larger, more light will come in. You want a lens that opens as wide as possible to let as much light in as possible. A range of f/1.8 – f/4 is best. The smaller the number, the wider the aperture, and the more light will come in. Here are some lenses to consider for northern light photography, across a variety of camera systems. There are of course a great many other lenses to choose from at a variety of price points, but these should give you a good starting point. We also have a guide to the best lenses for travel photography in general if you are in the market for a new lens. To take photos of the Northern Lights, you need to shoot at longer exposures – usually from 5 to 30 seconds. Obviously, you won’t be able to hold your camera still for that length of time, and if you try to do so, you will end up with blurry images as the camera picks up your hand movements. Generally, it’s hard to hold a camera still for longer than around 1/60th of a second – let alone 5 seconds or more! 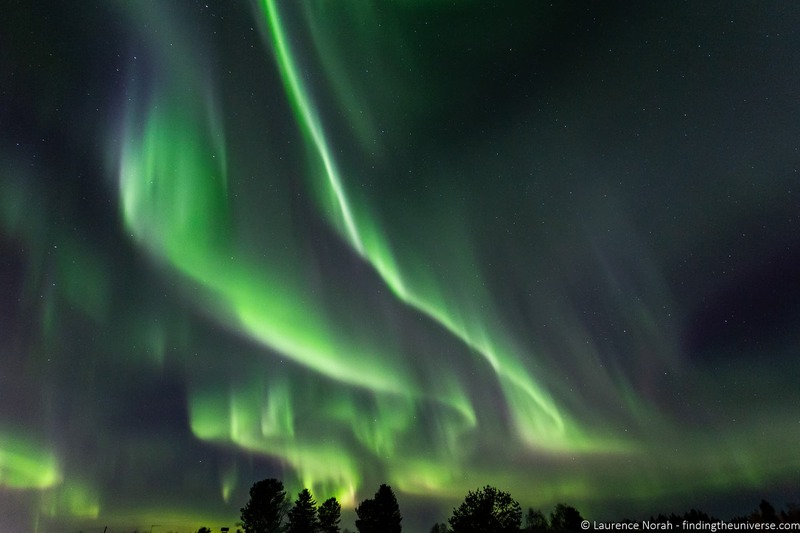 To solve this problem, you’re going to need a tripod, which I would suggest is a mandatory accessory for northern light photography, as well as other long exposure photography like astrophotography or for taking pictures of fireworks. A tripod will let you stabilize your camera and allow you to take a photo without holding the camera, meaning you’ll get sharp images even for long exposures. As well as a tripod, we suggest investing in a remote shutter release. When your camera is on the tripod, you still need a means of taking the picture, and pressing the shutter button can still cause some movement. A remote release like this will prevent that from happening. Note that nowadays a lot of cameras come with WiFi or Bluetooth connectivity, meaning you can trigger the photo from your smartphone. In cold weather though you might not want to take your gloves off, so a remote release is still a good idea! We think a tripod is essential for all sorts of photography, and we give our reasons why in our guide to why you need a travel tripod. We appreciate of course not everyone will want to invest in an expensive tripod though, or carry something large around, so we’ve come up with this short list of travel tripods to consider. These focus on being lightweight and smaller than some of the higher end tripods out there – perfect for travelling with. As well as all the above, there are a few other things you’ll definitely want to consider bringing when heading out to photograph the Northern Lights. As it’s likely to be cold (I’ve been out shooting at -35! ), you will definitely want to wrap up warm, with thermal baselayers, gloves, a hat, warm jacket and so on. See our guide to what to pack for winter in Finland and what to pack for winter in Iceland as a starting point for your packing list. You’ll also want to prepare your camera for the cold. I have a whole post on cold weather photography you should check out, which includes specific tips like bringing along sealable plastic bags and spare batteries. Finally, you will also want some sort of flashlight or torch. The light on your smartphone is one option, but you might find a headtorch to be easier as it will keep your hands free. I would also recommend that you get one that has the option to shine a red light (like this one) rather than a white light, as this will help you preserve your night vision. Now you’re ready to head out and take some pictures of the Northern Lights! At this point, you’ll need to know how to set your camera up. The bad news is that there is no one size fits all optimal camera setting for Northern Lights photography. The lights vary greatly in intensity and movement, depending on how lucky you are. Sometimes there will just be a faint glow, almost like green clouds. Other times, the sky will seem to be alive with green and red fire, undulating before your eyes. So you will definitely need to be prepared to review and adjust your settings as you go. However, there are some parameters for each setting that you will generally be shooting at. I’ll go through each of these. The first thing you need to do is make sure your camera is in the right mode for taking pictures of the Northern Lights. I would suggest putting the camera into fully manual mode, which will give you total control. Manual mode is usually accessed by the cameras main mode dial. On most cameras, this is found on the top of the camera body, and is a round dial you can rotate to different modes. One of these will likely be Auto, and then there will be a variety of other options. If your camera doesn’t have a mode dial, you’ll want to get into the settings menu to find a suitable mode. For a smartphone, this will be through one of our recommended apps, for a compact camera this will vary by model. If you do have a mode dial, manual mode will usually be marked as “M”. “M” mode means you have to set everything on the camera yourself – shutter speed, aperture and ISO. These three controls are commonly referred to as the “exposure triangle”. This is because adjusting any of them will affect the exposure, or overall brightness of the image. The goal is a correctly exposed image – not too bright, and not too dark. Now we’ll look at each of these settings individually. The shutter speed you pick for Northern Lights photography will depend a great deal on the movement of the lights in the sky, and the brightness of the lights. If the lights are pulsating relatively quickly and are quite bright, then you will want a relatively short shutter speed – around five seconds. Otherwise the clear patterns that your eyes see will be replaced by more blurry soft shapes as the camera captures the movement. A slower shutter speed will let less light in, so you might need to compensate by increasing the ISO. The aperture should already be set as wide as possible. If the lights are quite dim, or are not moving very much, then you can use a longer shutter speed (e.g., 15 or even 30 seconds). This will let more light in, so you will get brighter images. If they are looking too bright, you can reduce the ISO, which will also give you cleaner, less noisy images. You will usually want to pick as wide an aperture as possible for Northern Lights photography, to let as much light in as possible. Changing the aperture from f/4 to f/2.8 results in twice as much light being let in, which can make a huge difference to your photo. 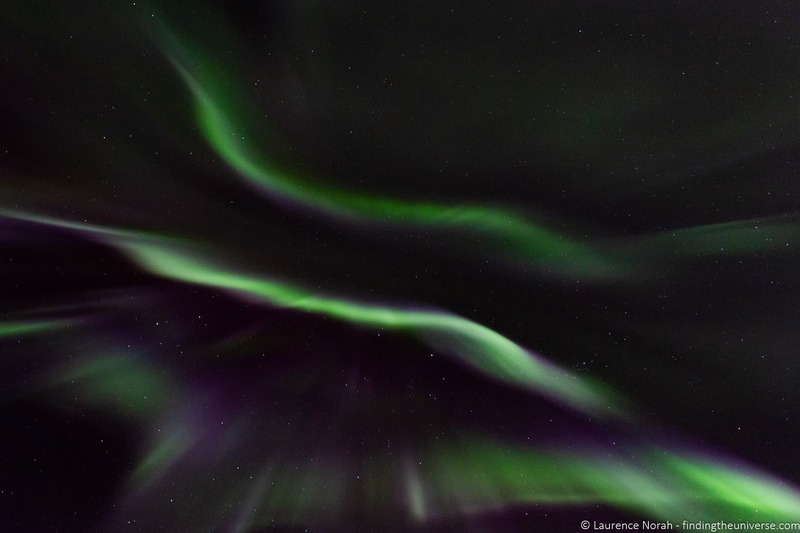 This is why the lenses I recommended for Northern Lights photography all tend to offer these wide apertures. They are also often referred to as “fast” lenses, because you can use a faster shutter speed due to the extra light the aperture lets in. For Northern Lights photography, I would advise using the biggest aperture the lens has available. Usually you would not want to change this – you will instead adjust shutter speed and ISO depending on the conditions. The ISO of your camera dictates how sensitive the camera’s sensor is to the light. If you increase the ISO, the camera becomes more sensitive, meaning the images will be brighter. Unfortunately, the side effect of increasing the sensitivity is that the images become noisier. This basically means there are going to be unwanted artefacts in the image, which can result in grainy shots. 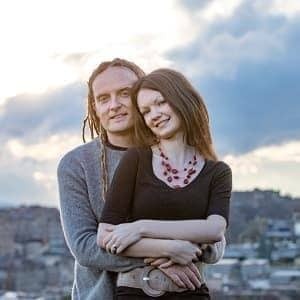 This graininess is often hard to see on your camera display, and will only be obvious when you get your photos onto a computer screen for editing. Different cameras have different capabilities. The majority of more modern cameras produce acceptable images up to ISO settings of 3200 or 6400. Some high end cameras can go well beyond this, whilst some compact cameras will struggle above ISO 1600 or even ISO 800. My advice is to experiment with your particular camera in advance of your trip, and check what is acceptable to you. The caveat here is that sometimes you won’t have a choice – if you can’t open the aperture any wider, and you can’t increase the shutter speed without getting a blurry image, then your only option is to increase the ISO. A noisy image is always preferable to a blurry image in my opinion, and noise can, to an extent, be edited in post production. In addition, noise is usually more of an issue if you are planning on blowing your images up to large sizes. For small prints, social media use, and sharing with your friends it likely won’t be an issue. Back to the main question! I would suggest starting at an ISO of 1600 and seeing what results you get. If the lights are dim, you might need to increase this to 3200 or even 6400. If the lights are fast moving, requiring a faster shutter speed, you might also need to increase it to let enough light in. So you have all your settings ready to go, and you’re pretty much ready to photograph the Northern Lights. There’s still one thing you’re going to have to do, which is actually one of the harder parts of shooting at night, and that is to focus your image. Most camera autofocus systems require a minimum amount of light to work, and can struggle when it is dark. So you need to prepare for this and know how you are going to get a sharp focus. The Northern Lights are relatively far away, so if you have a camera with manual focus, I advise setting it to manual focus mode and adjusting the focus using the manual focus ring (usually found on the lens) to the infinity mode. Note that some cameras, in particular Canon cameras, need to be focused just before infinity in order to get sharp images. It can be very hard to find focus in the dark, so my suggestion is to practice with your camera in the daylight, find the sharp focus point on a distant object, and make a note of where this is. If your camera has a focus ring, you could make a mark with a permanent marker so you know where it is. If you have a DSLR, using the live view instead of the optical viewfinder can also make finding focus easier. My tip is to zoom in on a part of the image on the liveview and try to find something like a star or other point of light that you can use as a focal point. If your camera doesn’t have a focus ring, it might have a manual focus option in the menu. If not, you will have to rely on the autofocus mechanism. If this is the case, try and find the brightest part of the sky and select that as s focus point. If you don’t get your focus right, you might get home with images that look like this, which is not going to be ideal! When taking photos, we sometimes have a choice of what type of image file format we want to save. The majority of cameras by default will save images as JPG (or JPEG) files. These are a compressed file format which are widely supported, and can be directly viewed or shared without any editing required. The other file format is known as RAW. This is an uncompressed data format which varies from camera to camera, and it is the file format which keeps the most data from your images. For shooting the Northern Lights, if your camera supports RAW, I would highly recommend you use RAW. Alternatively, most cameras also support a RAW + JPG option, which offers the best of both worlds at the expense of using up more memory card space. Shooting in RAW will give you greater control over the image, and will let you bring out the best of your photos using editing software after your shoot. For more on RAW, see my guide to RAW in photography. If you’re in the market for software to edit your RAW files, we have a guide to the best photography editing software too. Here’s a quick cheat sheet to help you remember your Northern Lights photography camera settings. That should get you started, but do review your photos as you go to be sure they are turning out as you want, and adjust as necessary as the sky changes. Here’s a downloadable image to help you remember the above. You are welcome to share and use this image, but please accredit it back to this article with a link if you do. If you read all the above and are worried that your camera doesn’t have a manual mode, and so you think you might not be able to photograph the Northern Lights, I have some good news. You can still photograph the Northern Lights with a compact camera or any camera that doesn’t have full manual controls. The results might not be quite as impressive, but at least you will get something to remember the moment. Here are some tips for photographing the Northern Lights with a compact camera or other camera that doesn’t have full manual control. Use a tripod. Even with a compact camera or smartphone, you will need a tripod to stabilise your camera to get the best images. See if the camera has any special modes for night photography. Some cameras have special night mode, long exposure modes, or fireworks modes. These will tell the camera software to take a long exposure. Disable the flash. At night there isn’t much light, and nearly every compact camera will try to compensate for this by firing the flash, which will have zero effect. You need to disable the flash so this doesn’t happen. Manually set the ISO. Most compact cameras will allow you to set the ISO yourself, even if they don’t have full manual controls. If they don’t let you set the exact number, they might let you set it as “High”, so the camera knows to use a higher ISO than normal. The answer is that yes, you can photograph the Northern Lights with an iPhone or other smartphone. However, there are some caveats! First of all, you are going to need some means of stabilizing your camera so it can take photos without picking up on your hand movements. The best option is going to be a phone mount for a tripod, or just a mini phone tripod. You will also need a way of directly adjusting the shutter speed. There are phone apps that will let you do this if the built-in app on your smartphone doesn’t allow for manual shutter speed settings. On Android, we recommend Open Camera, and on iOS we recommend the VSCO app, both of which let you manually set the shutter speed, and both of which are free. The majority of smartphones have a fixed wide open aperture, so you won’t need to change this. They will also usually set the ISO for you, but if you can control the ISO you will want to set it to a high value if you can. The below image was shot hand held with a Google Pixel 3 smartphone in night mode. As you can see, the image is certainly obvious as to what it is, but it’s not without its flaws, despite the Pixel 3 being widely regarded as having one of the better low light smartphone cameras. Now you know what you are doing when it comes to taking photos of the Northern Lights from a technical point of view. However, photography is not just about knowing how to set up your camera – whatever it is you are taking photos of. A great photo is more than having just the correct settings on your camera, it needs to be well composed. This is no different for the Northern Lights. Whilst they are spectacular in their own right, you will still want to follow the rules of composition. A good idea is to find a foreground subject like a cute cabin or igloo, that helps to put a bit more of context, scale, and story in your image. A person or even a line of trees will also help. If you are close to a body of water and it is a calm night, you can use this to create a reflection too. Another thing to bear in mind is that the Northern Lights are best seen when there is little to no light pollution. This means that you need to get far away from any sources of light to get the best views. If you are in a city, you will want to drive out of it and away from the glow. Of course, if the display is very powerful, some lights are not a big deal, as in this image, where the streetlights do not overwhelm the show. Compare that to this image, where the Northern Lights are almost lost in the haze of the city lights. But overall, you want to be somewhere as dark as possible to see the lights. If you have a foreground subject you want to illuminate, you can use a flashlight or even your smartphone light to illuminate it. Finally, don’t forget to enjoy the show. It can be easy to become overwhelmed with trying to get the perfect image, but you don’t want to miss one of the great experiences of life because you were busy staring at the back of your camera screen. Take your photos, but don’t forget to just look at the sky and be in awe of the display that nature is putting on. If you have a smartphone, there are some apps that you might find useful. 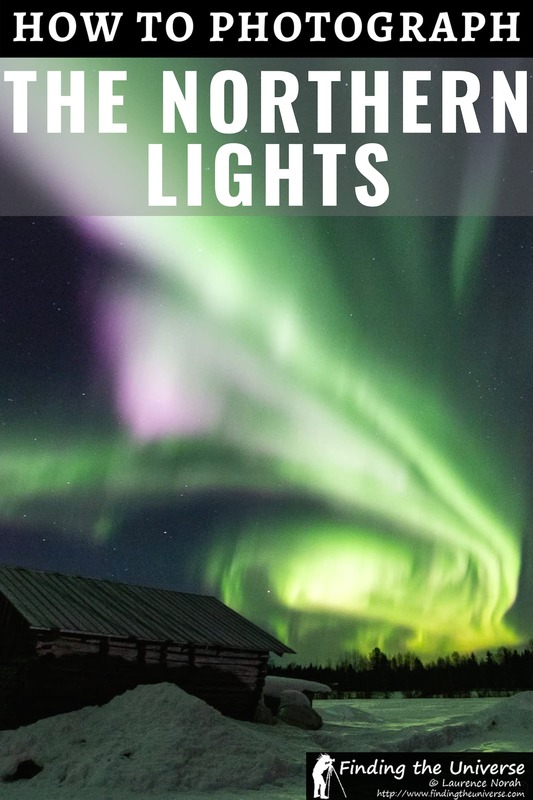 As well as the previously mentioned apps that you can use for northern light photography, there are some others that I also suggest you will find useful. If you are somewhere with access to the internet, then I can highly recommend getting an app that will notify you of aurora activity. These will take aurora forecast data from various sources, as well as weather data, and will notify you if there is a chance of seeing Northern Lights activity in your area. I have seen Northern Lights activity thanks to being notified by these apps, and they are in my mind invaluable. I have tried a few, and have settles on My Aurora Forecast Pro. I have found it to be the most reliable app that doesn’t drain my phone battery, but has always reliably alerted me to aurora activity. This is available for both Android and iOS, and is available in both free (ad-supported) and paid versions. The Photographer’s Ephemeris, also known as TPE, is an incredible app (and also a website) which uses a combination of mapping data and astronomy data to provide you with detailed information as to where the sun or moon will be. You can choose any point on earth using the map interface, and it will show you for that point what time the sun will rise and set, what time the moon will rise and set, and where in the sky the sun or moon will be. I find it really useful for scouting out locations ahead of time. It has satellite imagery as well as normal mapping data, so from a Northern Lights hunting perspective, is also a handy way of figuring out where you might find areas with limited street lighting (usually remote areas with no buildings). If you are visiting somewhere like Iceland or Finland, one good option for seeing the Northern Lights is to take a specific tour. The most common options are evening tours where you will be taken to good dark locations for viewing the northern lights. Some tours also include activities like snowmobiling. 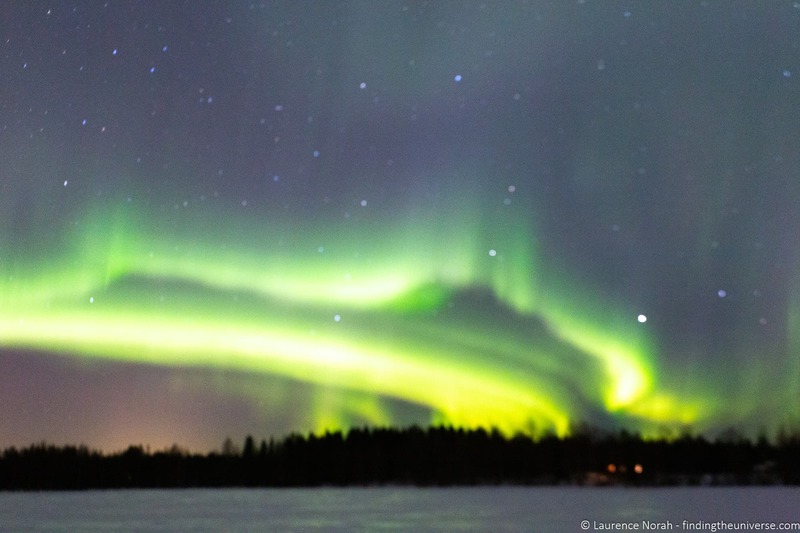 Here are some evening tours we suggest looking at for Iceland and Finland. Note that some companies have a policy where if you don’t see the northern lights on your trip, they will let you take another tour for free. So these are a good option. In Iceland, there are a number of companies offering evening Northern Lights tours. We suggest looking at the listings for Northern Lights Tours on Viator, GetYourGuide, Iceland Travel and Guide to Iceland. Some examples include this coach based tour, this small group tour, this well reviewed and good value coach option, and this more private super jeep tour. 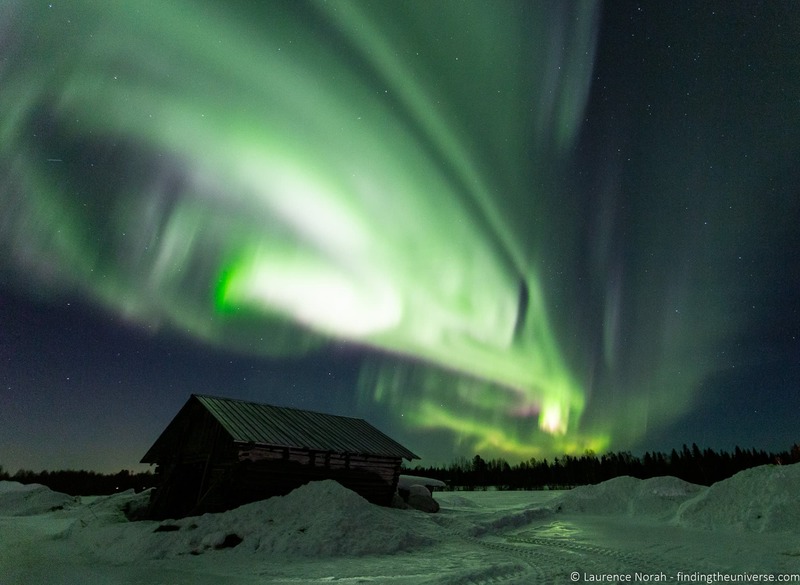 Finland is a very popular destination for the northern lights, with a large part of the country (anywhere north of Rovaniemi), actually inside the arctic circle. Tours depart from a number of locations in the country, predominantly from Rovaniemi, Levi, Saariselkä, and Ylläs. 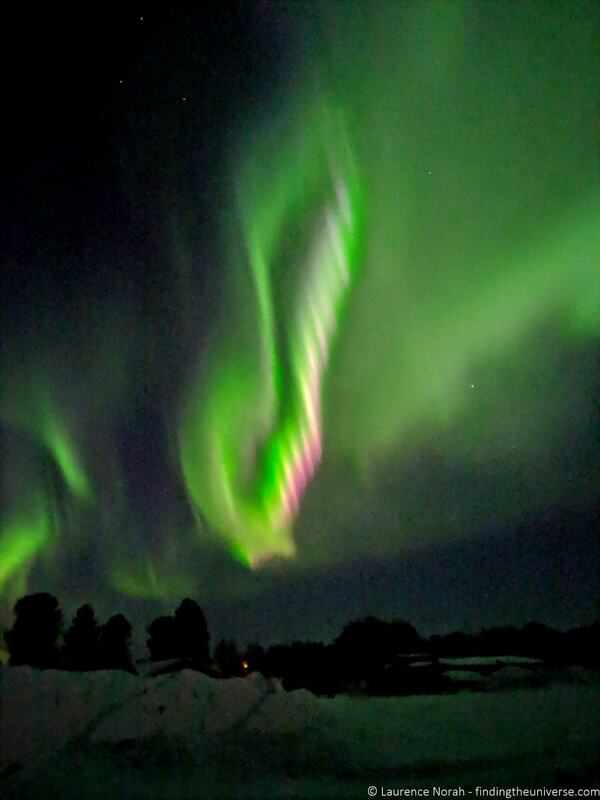 We’d suggest looking for northern lights tours on Viator and GetYourGuide. 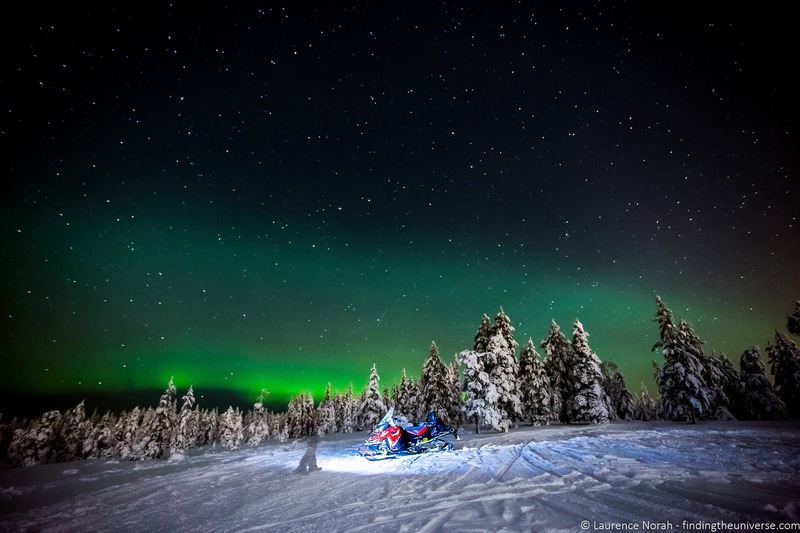 As examples of what is available, here’s a tour by snowmobile, this is a dedicated northern lights photography tour, and this is another northern lights photography tour. Canada is definitely the easiest place to see the Northern Lights from in North America. There are lots of tours to choose from, including this selection on GetYourGuide and these on Viator. Examples of what are available include this four hour tour in Yukon, and this tour from Yellowknife. It’s also possible to book a longer multi-day tour that focuses on seeing the Northern Lights, which will give you the best chance to see and photograph them. Here are some options to consider. Visiting Iceland in winter offers spectacular landscapes to explore, and wonderfully warm hot springs to relax in. Plus there’s the bonus of seeing the northern lights! Here are some multi-day guided tours that include northern lights viewing on Iceland Travel, Guide to Iceland, Tour Radar and Intrepid Travel. 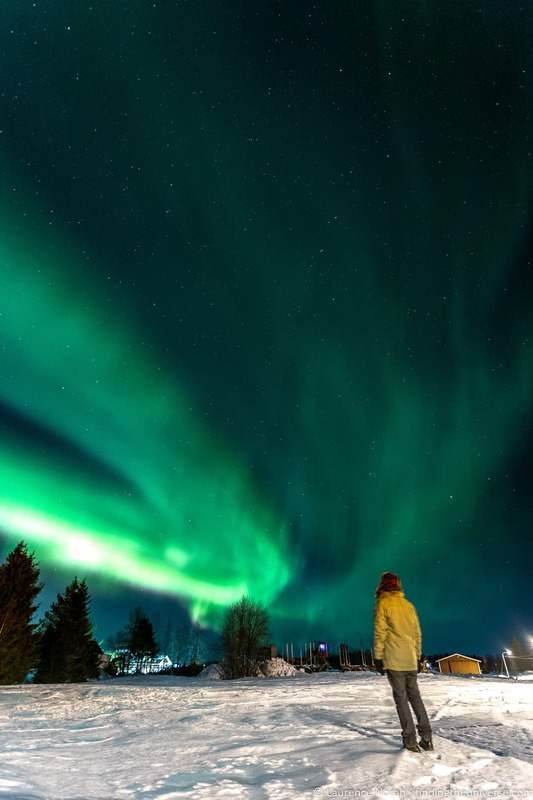 As an example, this 6 night tour of Iceland’s southern region with Intrepid Travel offers lots of options to see the Northern Lights, as well as many of the other highlights Iceland has to offer! There are a number of multi-day winter tours listed on Viator, the majority of which include northern lights viewing opportunities. Greenland is a massive island in the North Atlantic, and much of it lies above the arctic circle. A low population means minimal light pollution, offering excellent northern lights viewing opportunities. Here’s a 10 Day tour of Greenland in winter, giving you lots of opportunities for seeing the Northern Lights from a very northerly latitude. With so much of Canada sitting at a northerly latitude, and with a relatively sparse population in these regions, Canada makes for a fantastic viewing location for the Northern Lights. 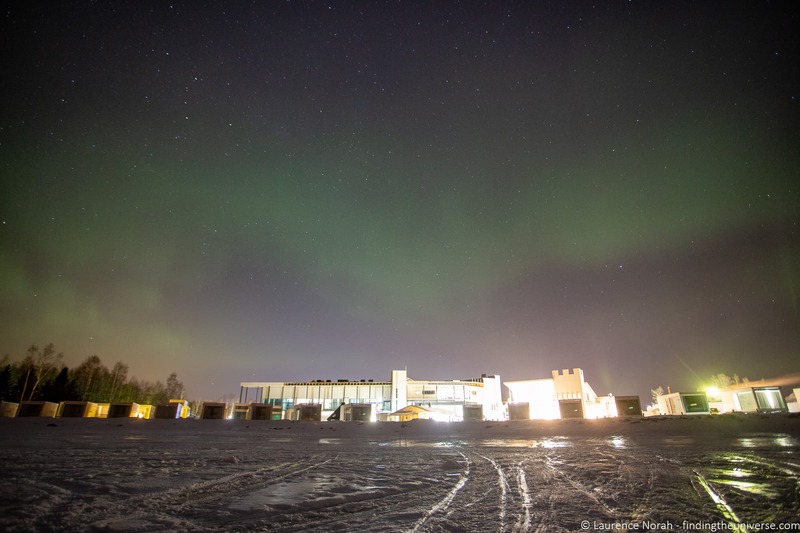 Here are some multi-day northern lights tours on Tour Radar and Viator to get you started. For examples are what are available, take a look at this 11 day tour of the Canadian Rockies, and this 4 day tour of Whitehorse from Vancouver. Hopefully this guide to taking pictures of the Northern Lights has helped prepare you for seeing and photographing this wonderful display. We’ve also have a number of other photography related posts and resources that we think you will find useful to help you improve your photography. If you’ve read this post and now think that a new camera might be in order, we have a detailed guide to the best travel cameras, as well as specific guides for the best compact camera, best mirrorless camera and best DSLR camera. If you have a camera and want to upgrade to a new lens, we also have a guide to the best camera lenses. Note that these are for travel photography in general though, the recommended lenses section of this post will be more useful for Northern Lights photography. And that’s it! As always, we hope you found our guide to Northern Lights photography helpful. We’re also happy to answer any questions you might have in the Comments section below.